No meal is complete for me without something raw. Seriously. Fruit for breakfast, green salad for lunch, and a salad or other raw accompaniment at dinner, that’s my routine. Raw vegetables and fruit seem to cleanse the palate. Throughout most of the year, I live on lettuce and other leafy greens, whether dandelion greens or baby kale. In the heat of the summer, they’re not great choices. But we have tomatoes, and cucumbers, and peppers, and all manner of great ingredients. You just have to get beyond the leafy stuff. I was reading recently about tomato boredom. People get stuck in the same repertoire, such as tomatoes with fresh mozzarella and basil, even though that dish can be changed up by varying the size, cut, and color of the tomatoes and the basil leaves. 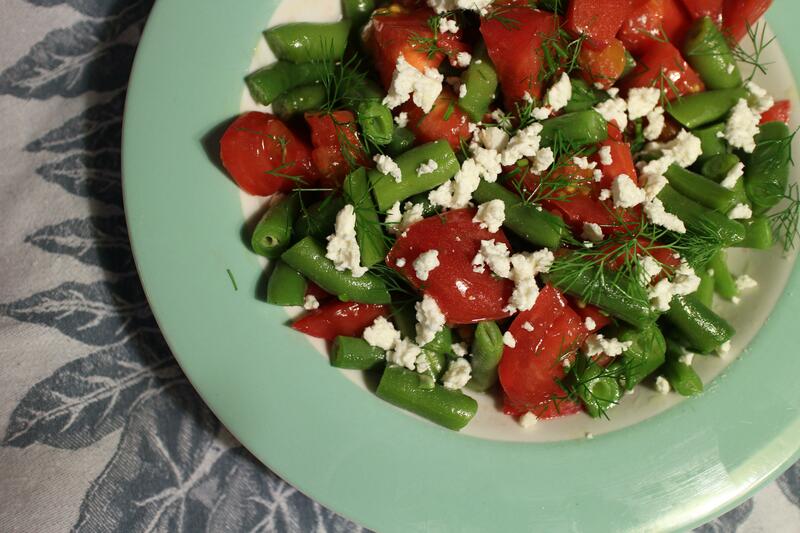 One of my favorite variations is a plate of blanched green or yellow beans with chopped tomatoes marinated with salt and olive oil, and sprinkled with feta and dill. It has enough body to make an entire meal with some crusty bread on the side. It’s an easy accompaniment to a summer buffet. Or you can do as I do, and have it for breakfast.